Register for the TEPSA book launch ‘The Future of Europe – Views from the Capitals’ in Brussels! 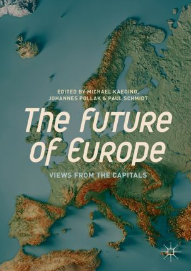 The Trans European Policy Studies Association (TEPSA) and the Austrian Society for European Politics have the honour of inviting you to the launch of the book ‘The Future of Europe – Views from the Capitals’ on 27 September 2018 at 17.30 at the Vienna House, Avenue de Tervuren 58, Brussels (metro 1 & 5, Merode). Authors of book chapters from Austria, Finland, Slovakia, Spain and Switzerland will share their insights. See the full agenda of the event here. Please register for the event below by 25 September. Registration is mandatory.